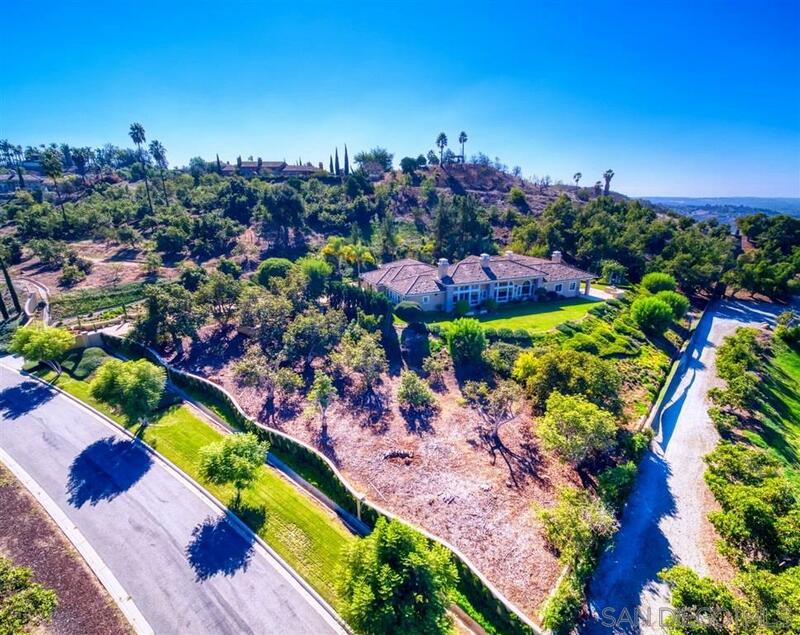 Stunning gated 4.12 acres Bonsall Estate with views for days! As you breeze through the courtyard you will gaze upon a majestic fountain, romantic landscaped vignettes and a lanai outfitted for all your gatherings. Large arched windows let the natural light cascade in highlighting the beautiful hardwood floors that span throughout the home. A neutral paint scheme with crisp white trim beautifully accent the natural finish of the floors., The family room, which is adjacent to the spacious kitchen, has a massive custom fireplace, recessed lighting, and exterior patio access via French doors. The kitchen was designed with functionality and aesthetics in mind, perfect for entertaining. Gorgeous granite countertops with full granite backsplash, top of the line stainless steel appliances, rich custom cabinetry and a large sit-at island. A spacious dining room has gorgeous views of the valley and is the perfect space for entertaining. The master bedroom will spoil you with its floor-to-ceiling windows revealing the spectacular views, a cozy gas fireplace, and a private entrance to the backyard. The master bathroom will provide you with a spa-like experience with an elegant soaking tub, spacious step-in shower featuring dual shower heads and illuminated by privacy windows and two walk-in closets. The split bedroom design offers privacy and convenience. The four car garage will store all your toys. The property has so many exquisite landscaping touches from mature rose gardens, fountains, rambling pathways all framed by those breathtaking views. To see it is to love it!